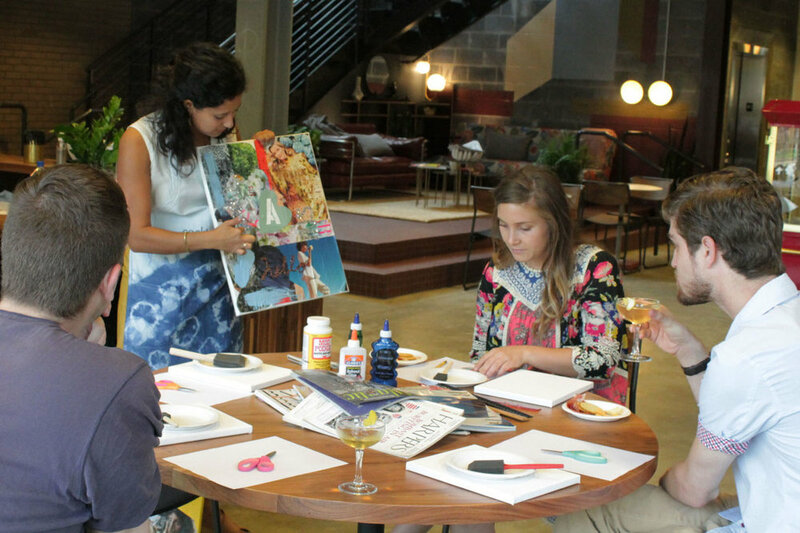 A Distill Creative art or craft workshop or craft station is a unique way to build camaraderie at your company or launch a new product. Whether it’s a team-building get together or book launch, we’ll make sure your guests spark their creativity and get to know each other while making something they will love. We’ve been to many networking events, launch parties, and happy hours, and we can guarantee you that having us at your next corporate event will make it much more successful than if you just had drinks. Also, we love drinks and are happy to create a custom cocktail or beverage specific to your event. This package includes a structured, hands-on creative project where guests will learn basic techniques and complete their project during the event. We’ve developed these workshops to be fun and easy for all skill levels. We can also create a custom project for your event and even bring in guests artists who specialize in a specific art or craft. Price includes everything you need to make your art or craft project and a Distill Creative host to guide and teach your guests. Distill Creative parties can come to your office, event space, or retail location. We can also host in our studio in Dumbo, Brooklyn, NYC. We serve the New York Metro area, Washington, DC metro area, or Southern California. We can host parties of up to a couple hundred people with a minimum of at least 6 people. We are happy to work with you to modify or create a project that works for your event. If you have less than 6 people, you can book a private lesson, an Airbnb Experience in NYC, or attend one of our public workshops. Our workshops are typically two hours, but we can modify them to work for your event. We can also create a make and take project for larger events. Our projects are developed to work with a variety of skill levels. Your Distill Creative host will cater to the specific skill of your guests, but be sure to let us know if you want us to create a super easy or super hard project! You are welcome to provide your own food and beverages for your event. We are happy to add on catering to your event for a fee if you want us to take care of it, but our speciality is really the creative project and staging! If you are hosting in our Brooklyn studio, you can bring your own food and beverages (including alcohol). We can also create a custom cocktail recipe for an added fee, just let us know! We can provide decor for an added fee. You can provide your own decor and you can definitely bring your own decorations if you hosting in our Distill Creative Studio in Brooklyn, NYC. Corporate Event Packages range from $700 - $3,000+. Pricing is dependent on type of craft, size of party, location, length of party, and any additional services added. Please let us know your budget so we can provide options that will work for your event. 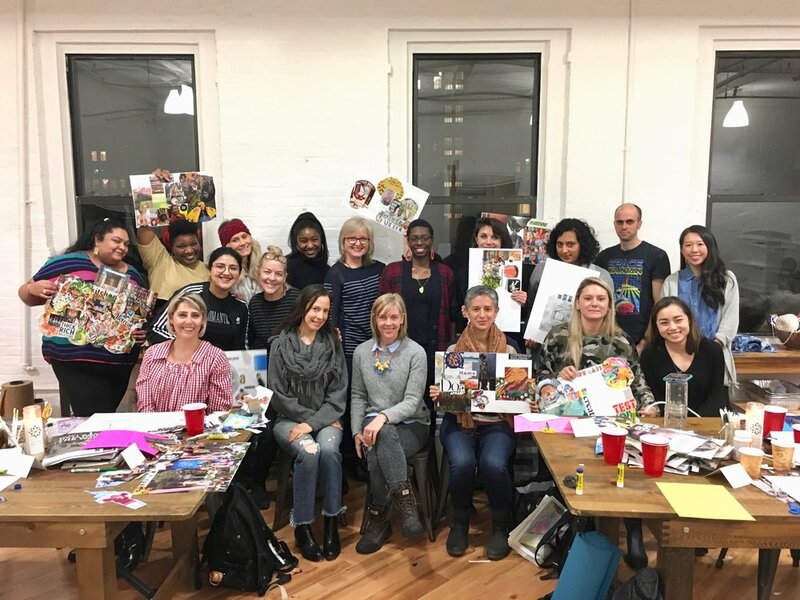 Making vision boards in a group setting is a casual way to break the ice with new employees or strangers and encourage creativity in all types of personalities. We’ll make sure you guests feel comfortable and confident to create. We’ve seen amazing outcomes from this workshop! Whether you’re celebrating an IPO or an Impact Report, having a creative project or experience for your employees will make it feel less mandatory and more celebratory. We can create a project for your milestone or you can pick one of our existing craft projects. We can also create a unique experience to help your employees learn about the milestone or report. Creating in a group setting is a unique way to celebrate a book launch. 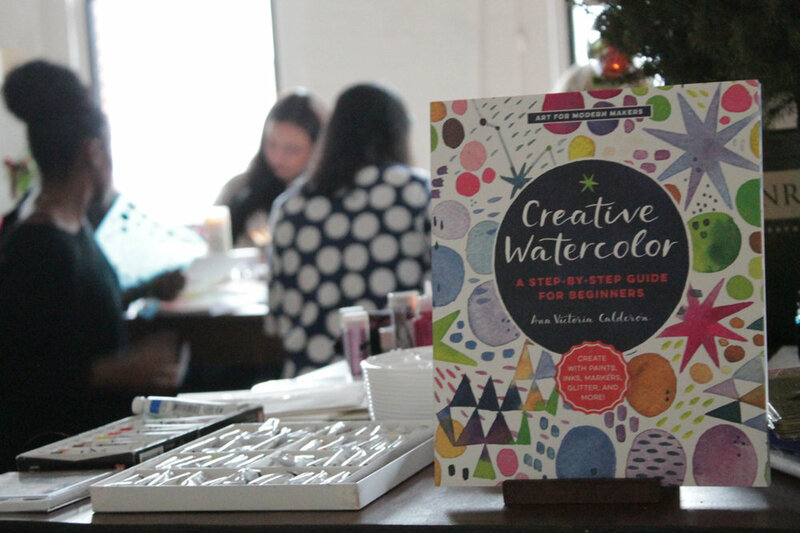 We enjoy hosting guest artists and creators in our Brooklyn studio and can provide materials and supplies that you need to make it a successful event. Block printing is an excellent team-building activity because it is fun for all skill levels and brings out the creative in everyone. You can choose to print on paper or fabric, like a classic tote, and we can even incorporate your company swag or branding.